TrophoWell, a testing platform that serves as an alternative to animal testing in patient-personalized medicine, earned top honors in the 2019 Cheng Wu Innovation Challenge at the School of Informatics, Computing, and Engineering. TrophoWell, a system that uses stem cells from patients to grow cultures that can test drugs while personalizing medical treatment, was awarded $10,000 for top honors in the competition. The challenge supports students who are learning to develop technological innovations that are unconstrained by any immediate consideration of their commercial potential. 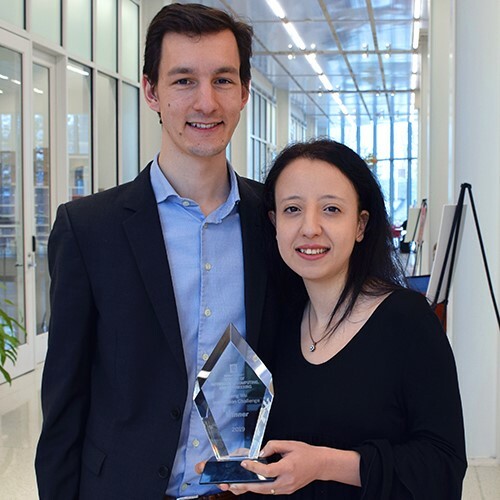 The TrophoWell team was led by Louis van der Elst and Merve Gokce Kurtoglu, two Ph.D. students in the intelligent systems engineering program at SICE who are part of ISE’s Fibers and Additive Manufacturing Enabled Systems (FAMES) Lab. Kurtoglu previously worked as a research engineer for a biomedical device company, and she came to SICE with an eye on combining computing with biology to help patients. Van der Elst has a background in electrical engineering, and his work with TrophoWell is an extension of his desire to innovate. “The interdisciplinary ISE program at SICE was attractive to me because it allowed me to get beyond what I had been taught previously and apply my knowledge to a new area,” van der Elst said. Two other teams earned prizes of $2,500 each. Project Zeno, which aims to create virtual reality therapy to combat delirium for patients in intensive care, was presented by computer science student William Smith, and Katreen Boustani, Jiaxi Lu, and Christian D’Alessio, who are informatics majors. Fibers from 3D-printed glass preforms, which can create “smart” fibers for wearable technology more efficiently through 3D printing of glass fibers, was presented by ISE Ph.D. students Mengxin Zheng and Camila Faccini de Lima. Winners were selected by a panel of judges from among eight finalists. Other projects included a sensor that can sense when a hacker is attacking a device, a “smart” walker to aid the elderly, and a device that provides haptic feedback for the visually impaired. The Cheng Wu Innovation Challenge is in its fourth year. Each team was allowed 15 minutes to present their innovation and answer questions, and the teams were judged on the novelty of their work, whether it is user-centered and technologically feasible, and whether the innovation isn’t an obvious solution to a problem. Brown encourages students to get out of their comfort zone to explore opportunities to bring their ideas to life.